With the magnolias and jasmine blooming in Melbourne, New York and winter seem a world away. Revisiting my trip as I finalised my report was a real joy, and confirmed for me what a valuable and interesting experience the fellowship is. So here it is on the APA website, Is Young Adult literature all grown up? 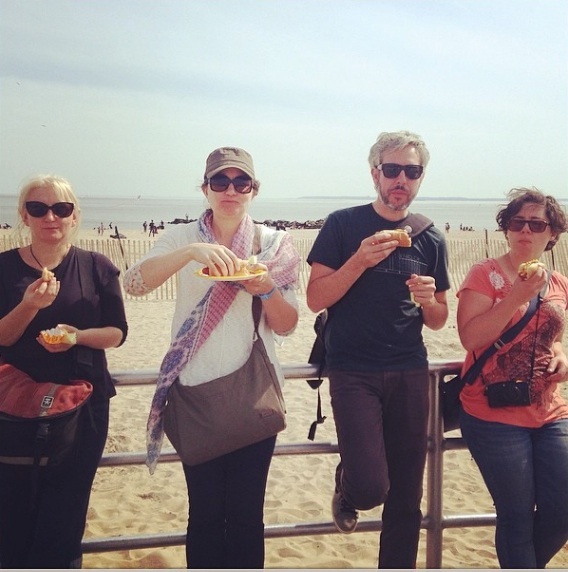 The Beatrice Davis Editorial Fellowship report 2014. I do hope it’s useful and interesting. If you have any questions about the report, or my trip, or anything else, feel free to get in touch with me directly. The Beatrice Davis Editorial Fellowship is such a valuable opportunity and an enriching experience, and I very much look forward to following the next fellow’s journey. I should have written this post a couple of weeks ago. But now that I am literally packing my bags (I may have had to buy a second bag to pack. I blame Uniqlo; I blame Anthropolgie; I blame the MoMa design store), I have to face facts. My time in New York as the Beatrice Davis Fellow 2014 is over. My last few meetings and appointments were pure joy. Big thanks to Erica Sussman at Harper Teen. (Among many other things, she looks after the Laura Ingalls Wilder list. OMFG.) Thanks to the crew at Knopf for having me back again. And huge big kisses to the beyond-delightful Barry Goldblatt and Libba Bray - thank you for your thoughtful insights, your warmth and humour, and for such a delicious dinner. PLEASE COME BACK TO AUS TO VISIT US SOON OKAY THANKS. Thank you also to the incomparable Jane Starr, for such an interesting discussion about books and publishing and scouting and New York and YA and love of reading, and oh, so much good stuff. Not to mention just a gorgeous lunch. Thank you, thank you! Thank you to EVERYONE that I met with over my time in NYC. So many people were so generous with their time and energy and knowledge and insight. I have been very lucky and privileged. And I'm so grateful. And there were so many people I didn't get a chance to speak to. So many places I didn't go and people I didn't meet. I'm leaving NYC with a sense that the world of publishing is so huge and diverse that in many ways I just brushed the surface. But boy do I have a lot to think on, mull over and write about in my report. The Empire State from the Top of the Rock. Didn't see Liz Lemon anywhere around Rockefeller Plaza - but I communed with her spirit. It okay, don't be cry. Blossom and blue skies! Spring arrived! 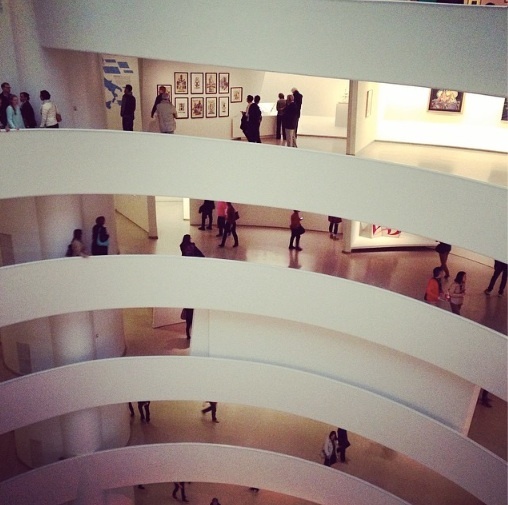 The Guggenheim, of course. I think my favourite gallery experience might be a tie between the Frick and PS1. (Yeah nah, they're nothing alike.) but I also really enjoyed the Whitney's Biennial and the New Museum. Matilda! The most bookish musical in town! So gorgeous. And my man came to join me. I'll me home on the weekend. Home in time for more winter. Boo. But also home for footy (Let's go, Cats! ), for vegemite, for currency that makes sense, for engaged locks on public toilets, for my own bed and my favourite coffee emporia... oh and for my family, and for my crew at A&U. YAY! Well - that was an intense and interesting week. I'm back in New York, attempting to sift through my overflowing brain for coherent thoughts about the amazing Bologna Book Fair. I will post thoughts and photos soon. In the meantime, enjoy some glowing Moomins... I certainly did. This week I've had a lovely peek at HarperCollins and Holiday House, a squizz at JP Morgan's personal library (and his custom-made vault for Precious Items), and a glimpse into the mind of Antoine de Saint-Exupéry. My drawing was not a picture of a hat. It was a picture of a boa constrictor digesting an elephant. But since the grown-ups were not able to understand it, I made another drawing: I drew the inside of a boa constrictor, so that the grown-ups could see it clearly. They always need to have things explained. More evidence of my people. Tomorrow, I fly off to Bologna for the children's book fair. I am very excited, and rather trepidatious. Reporting from the field will be dependent on wifi availability. But I expect to get back to New York for the final weeks of my stay with all sorts of thoughts about international trends in YA - what people are looking for, what they are selling, what they never want to see any more of again ever. I also hope to have few thoughts on regional Italian food. Eeeexcellent. 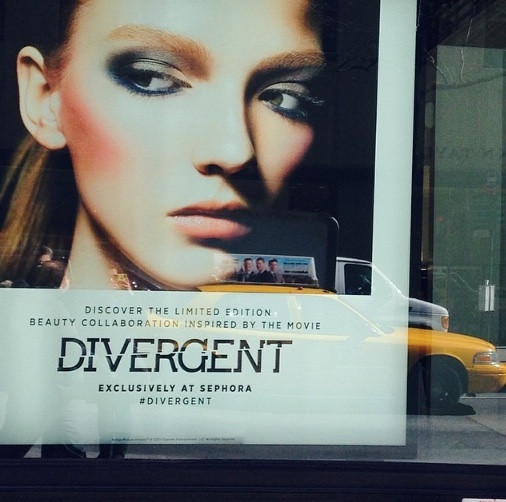 A "beauty collaboration" inspired by the movie (inspired by the book). I have lost the ability to even.